William Watson's great-great-great-great-grandson now lives in New Zealand and is researching the family history. Here are some initial findings about William Watson. Can anyone else help? If so, please leave information via the 'Comment' link at the bottom of this page. William Watson was long term resident of Farnsfield and was the grandson of Sir Beaumont Dixie. Watson married Catherine Clay in 1779, and was buried in 1815 at Southwell Minster with military honours - having served many years in the East Indian Army (as did his three sons). "The Watsons were a family that had lived in the village at least since the early seventeenth century, the earliest reference to them dating from 1612. "The next mention of a Watson happens in 1710 when a Watson was occupying Farnsfield Hall. William Watson died in 1755 leaving the hall and his lands to John Watson, who was to be the principal beneficiary of the enclosures." 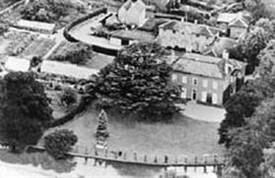 Enclosure took place in Farnsfield in 1777 with John Watson receiving 467 acres; his mother and wife gaining 138 acres between them. Mary Rigg notes that upon John's death in 1789 his late wife's money went to the family, but that he left most of the Farnsfield estate to a Sarah Thornally. "The burial records show why", explains Mary Rigg: "In 1795 John Watson Thornally, 'base' child of Sarah Thornally was buried in Farnsfield churchyard. Major William watson, John Watson's younger brother, in making his own will in 1815 stated 'My paternal estate at Farnsfield I have before been deprived of'". p.60 - William Watson was one of the two original trustees of a fund set up to establish a school in Farnsfield - which was subsequently achieved. This page was added by Website Administrator on 10/05/2013. If you are interested in the Watsons from the 1500s in Farnsfield & Kirklington, India & Australia etc.etc contact me! Thanks for the follow-up to these notes on the Watsons. Would you be interested in adding a page to OurNottinghamshire outlining the family in Nottinghamshire and beyond? David Hool, I have just seen your note. How do we make contact? Many thanks for your offer. I am currently researching an interesting Indian object that was collected by William Watson in Delhi in 1774. Would be good to know if other Indian items were collected by him.